Baan Thai is a really very nice restaurant indeed - the food is excellent and the service equal to it. We visited on a Saturday night and although it was seriously busy, the staff at Baan Thai did brilliantly and made us feel like we were the only ones there. I'm seriously disappointed with this establishment. I just ordered a delivery - waited for an hour and 15 minutes for my order, despite calling at 45 minutes past and then an hour I was told that it was because of a problem with the computer system. I was offered nothing by way of compensation because I had already pre-paid and they brought nothing more to my door. I asked for a refund and had a knock on the door from the driver asking for the food back - quite intimidating! I then called back and was told that he didn't have time to speak to me and hung up the phone on me. Granted the food is not bad, slightly greasy and by the time we got the food we were so hungry it tasted good. I will never order from this company and would advise everybody else to steer clear. Reviewer: (Anonymous) Very convenient if going to a gig at the academy, food served quickly and tasty. Baan Thai in Brixton is a great find. Service is extremely friendly and quick, and the food is delicious. This is the second time we have dined here and would not hesitate to make it a third! 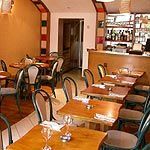 This restaurant is ideal for eating some great food, and drinking some good wine before heading on to a gig or catching a film. We had a lovely meal yeasterday with our friends at Baathai.We really impressed with the food and price.You dont miss it on Coldharbour lane.They do online delivery as well.? We went to visit brixton and were very hungry suddently we discovered baanthai a little nice Thai restaurant.Our chicken grapao,kung shee,veg tampura was fabulous .Sevice was excellent.We highly recommand for a quick meal at BaanThai.? Baan Thai is a small restaurant located a stones throw away from Brixton Market on the busy Coldharbour Lane. Serving an extensive range of well presented sizzling Thai fish, meat and vegetarian dishes to eat in or take away, Baan Thai provides a memorable dining experience for lovers of spicy Asian cuisine. 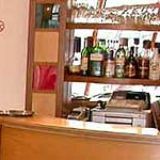 The restaurant is simply decorated with the well stocked bar a noticeable feature in what is a compact dining area. 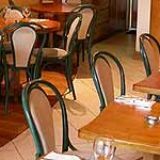 Carved wooden tables of varying sizes provide ample room for hungry diners, who are typically a mix of families, couples and young groups enjoying the generous portions of fresh food served here. Decor is simple and functional as the primary focus is on serving exceptional food. Baan Thai provides a calm and relaxing environment in which to unwind and enjoy all it has to offer, with traditional Thai instrumental music playing in the background. Staff here are laid back and provide an attentive service while ensuring visitors have the time to sit back and enjoy conversation without being disturbed. Fragrant prawn crackers are served before the starters, which range in price from £4 up to £12 for sharing platters, which provide the perfect opportunity to sample the many traditional meat and vegetarian appetisers available. Money bags (£3.95) provide a mouth-watering start, crispy parcels of blended spicy seasoned chicken and prawns expertly presented of pristine square plates with a separate dish of a hot chilli dipping sauce balanced out with a small garnish of crispy carrot and cooling cucumber. Another revelation are the large but tender seasoned mussels (£4.50), served drizzled with a homemade tangy lemon and garlic sauce and the signature chilli dip. In addition to soup and salad options you can choose from Chef’s Specials including Gai Krata (£8.50), a chicken dish served sizzling from the kitchen with tender chicken pieces mixed with carrot, red chillies, sharp pepper strips and crispy onions. This spicy dish is best complemented with slightly sweet sticky rice (£2.75), served in a small wicker container, which serves to cool the heat generated from the chillies. A milder choice is the roast duck curry (£8.50), a colourful dish, again superbly presented with the sweet flavour of pineapple and coconut mixed into the hot red curry paste. The duck is seasoned with ginger and carries a subtle hint of lemongrass and the soft tomatoes and aubergines, while not soggy, complete this popular dish perfectly. Side dishes include a helping of egg fried rice (£2.75), surprisingly light and simply served, packed with a generous helping of bright yellow egg. Dessert options are limited but this is not a problem in a venue with such an extensive range of savoury dishes. The traditional green pancake (£4.50) is stuffed with chopped coconut, drizzled with sweet syrup and carries a strong essence of almonds. The banana spilt (£4.50) is a more substantial choice. Served in an egg shaped container, the ingredients – bananas in a rich chocolate ice cream and cherry infused cream – are covered with a topping of children’s favourite hundreds and thousands in a break from Baan Thai’s traditional Thai menu. There is a well stocked bar at Baan Thai were diners can enjoy traditional beer such as Singha (£2.50), spirit or wine options to accompany their meal. House wines starting from under £10 include a medium red with a strong flavour of plums and berries which complements the curry dishes prepared here perfectly. A wide range of soft drink options are available for both eat in and take away diners. Baan Thai stands out as an exceptional Thai restaurant in this area of South London. Helpful staff and relaxed surroundings make this a perfect choice for those looking to try traditional Thai dishes prepared with fresh ingredients and presented in first class style.